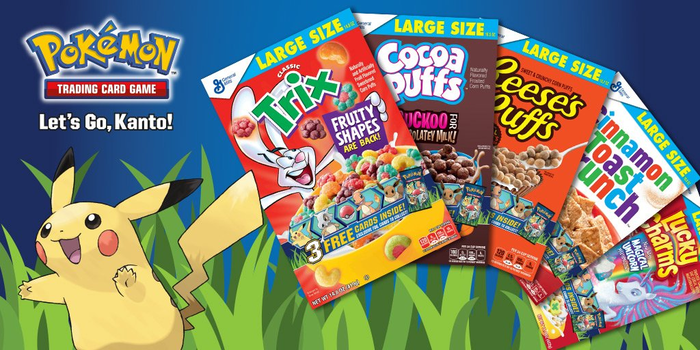 The official Pokémon website has announced that for a limited time until March 30th, 2019, specially marked boxes of General Mills breakfast cereals in the United States will include Pokémon Trading Card Game cards. For a limited time, find Pokémon Trading Card Game cards in specially marked boxes of Big G Cereals. The next time you sit down for a delicious breakfast, don't miss out on your chance to get some cool Pokémon Trading Card Game cards. For a limited time, select Big G Cereals will include a pack of three Pokémon TCG cards highlighting Pokémon that were originally discovered in the Kanto region. Each pack contains two common cards and one of four special foil cards featuring Pikachu, Eevee, Charmander, or Cubone. In family-size cereal boxes at Walmart stores, you can get one of five foil cards, including Bulbasaur. Look for cards in specially marked boxes of Cinnamon Toast Crunch, Lucky Charms, Cocoa Puffs, Trix, and Reese's Peanut Butter Puffs. There are 13 collectible cards in all (including the foil Bulbasaur), and you'll find them in stores through March 30, 2019. So fill your bowl and start your day with the Pokémon TCG. Just make sure you don't accidentally drop those cards in your milk!